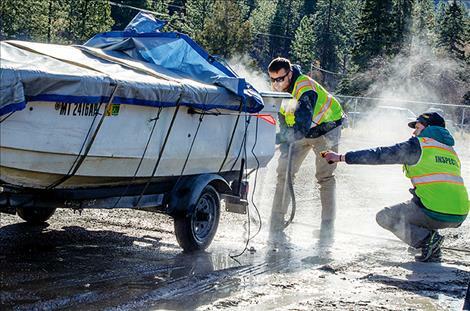 As a precautionary measure, inspectors wash a boat during the 2018 boating season that was brought to Montana from a state with a known mussel infestation. The inspector on the right holds a temperature guage to make sure the water temperature is hot enough to kill any potential mussels or larvae. HELENA – This year was record-setting for Montana Fish Wildlife and Park’s statewide partners in the rigorous battle against Aquatic Invasive Species. As the front line on the battle against aquatic invasive species, FWP collaborated with partners across the state to operate 35 watercraft inspection stations. The partners include: the Confederated Salish and Kootenai Tribes, Bighorn Canyon National Recreation Area, the Blackfeet Tribe, Garfield Conservation District, Glacier National Park, Missoula County Weed District and Whitefish Lake Institute. Prior to launching into any body of water in Montana, motorists carrying or towing any water-based equipment, which includes everything from motorized boats to kayaks to inflatable paddle boards, are required to stop and be inspected at all watercraft inspection stations they encounter while traveling in Montana. Collectively, these inspection stations inspected more than 100,000 watercraft in 2018, issued more than 50 citations and 170 warnings related to invasive species violations. Sixteen out-of-state vessels were identified as mussel contaminated. FWP collected and tested more than 2,000 plankton samples for mussels with early detection analysis, along with 1,450 samples from 250 unique bodies of water in the state to check for aquatic invasive plants and animals. FWP reported that no new mussel veliger or adult mussels were detected in Montana waters this year. In July, Environmental DNA (eDNA) genetic tests were conducted on water samples and mussel-sniffing dogs were deployed in search of adult mussels at Tiber reservoir, the lone body of water in the state that has tested positive for mussels, and no mussel DNA or adult mussels were discovered. Testing and inspections are only part of the state's AIS prevention efforts. With the threat of invasive mussels looming, educating and informing the public about how to prevent the spread of invasive species is another prevention strategy used by FWP. Basic prevention procedures can reduce the chances of transporting invasive species. Cleaning watercraft before launching into another body of water, which includes the removal of plants, animals and mud is emphasized. Boaters were reminded to clean, drain and dry all watercraft and equipment after leaving any body of water. Boaters and recreationists can expect to see changes next season as planning is currently underway to make the AIS program more efficient in its efforts to keep exotic mussels and other invasive species out of the state’s waterways. At the present time, inspection stations are closed for the winter. For more information pertaining to watercraft inspections and the AIS program, visit www.cleandraindrymt.com or www.CSKTnomussels.org. Native to Russia, zebra and quagga mussels are minuscule mollusks with sharp shells. The organisms often have a striped pattern on the shell, which inspired their name. The quagga mussel is named after an extinct African zebra. The invasive mussel species were transported and released in the Great Lakes some 30 years ago from the ballast of a Russian ship and have since spread throughout the United States in regions of the Northeast, upper Midwest, Southeast and Southwest. Once a zebra and quagga mussel infestation becomes established in a water body, they have the potential to be very destructive to the ecological and economic infrastructures and are impossible to fully eradicate. These freshwater mussels rapidly colonize on any underwater hard surface and collectively become rock-hard masses that clog irrigation systems, foul hydropower dams, ruin boat motors and damage personal recreational equipment. They also cover boat docks and rocky beaches, creating hazardous conditions for swimmers, boaters and other users – something FWP and their partners are working to prevent.